After I graduated from the University of Colorado and taught one year in Boulder Colorado, Ed and I decided to seek another adventure, signing on to teach in the American Community School in Benghazi, Libya. Our students were the dependents of oil company employees, the American Military Advisory Group, and American Embassy staff members - all of whom were stationed there. Libya was a Kingdom at that time, and one of our students was the daughter of one of the King's sons. At that time, Libyan men who could afford it had several wives, so she was one of many of his offspring. We had a number of other non-American students who were the children of workers from other nations - Sweden, Germany, Belgium, Pakistan, China, etc. Some spoke a little English, most did not. 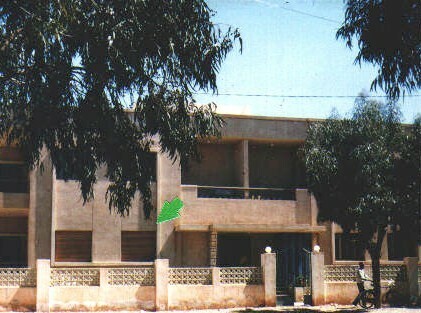 Here is the compound where we lived - the residence of all of the teachers at our school. There were four very large apartments with high ceilings and terrazo floors. The government encouraged us strongly to hire locals and we had a houseboy and two ghaffirs - one to watch our house and grounds in the daytime, and the other to watch out for us at night. Mohammed, Othman and Monseur were boundless sources of cultural and practical information. We laughed with them at some of our goofy misunderstandings, and they got the giggles when they saw Ed and me holding hands and kissing affectionately.